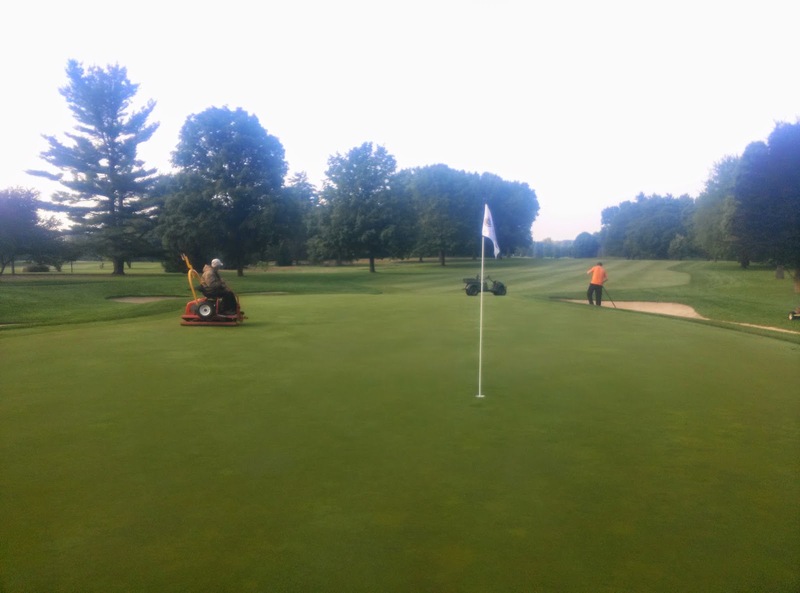 With the forecast for Thursday and Friday calling for a good chance of rain, we have decided to move greens aerification to Monday and Tuesday, October 6th and 7th. We need a full day to properly clean and fill the holes with topdressing, and two good days back to back so that we do not have 9 cored and 9 uncored. Thanks in advance for your understanding. If there are any further changes to the schedule, I will let you know. Have a great day! Our tee aerification that was postponed by rain on September 10th has been rescheduled for Monday the 22nd. The clubhouse and course are closed that day. Greens aerification is still on schedule for Thursday, October 2nd, and Friday, October 3rd. 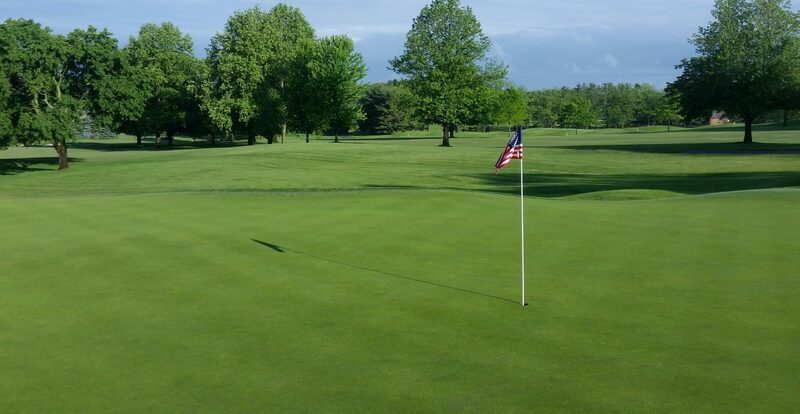 We will have 9 holes each day closed for play. With the gradual improvement in the playability of the green surrounds, I have decided to hold off on an aggressive verticut. The fertilizer we applied late July has promoted growth of new leaf tissue that has, in most spots, provided a more consistent lie for any shots and I feel that I would be doing more harm than good at this time in the year by aggressively cutting the older stems off. We will be aerifying the green surrounds within the next two weeks in between play to further promote turf health. I will continue to monitor these conditions and communicate any practices that may be needed if they deteriorate again. Oliphant’s crew will begin mobilizing on the 5th to begin early morning on the 6th. The existing sod will be removed, and saved so as much as possible can be re-layed on the new green. Then, grade work will be performed in accordance with the above plan. Soil amendments will be added for turf health when the final grade has been achieved, and then the green and any surrounding turf affected will be sodded. Weather permitting, the project should take about 10 days. As was the case in 2011, both Arthur Hills and Oliphant Golf have requested that there be NO interference from the membership or other individuals during the project. This includes being on the construction site while work is being performed, giving personal opinions of how the green should look when completed, interfering with the crew while working etc. They are very good at what they do and have a solid plan for improving #18. This is also for your safety as well! I will be providing daily updates via the blog to keep you up to speed. This is an exciting project for Elcona and I cannot wait to start! 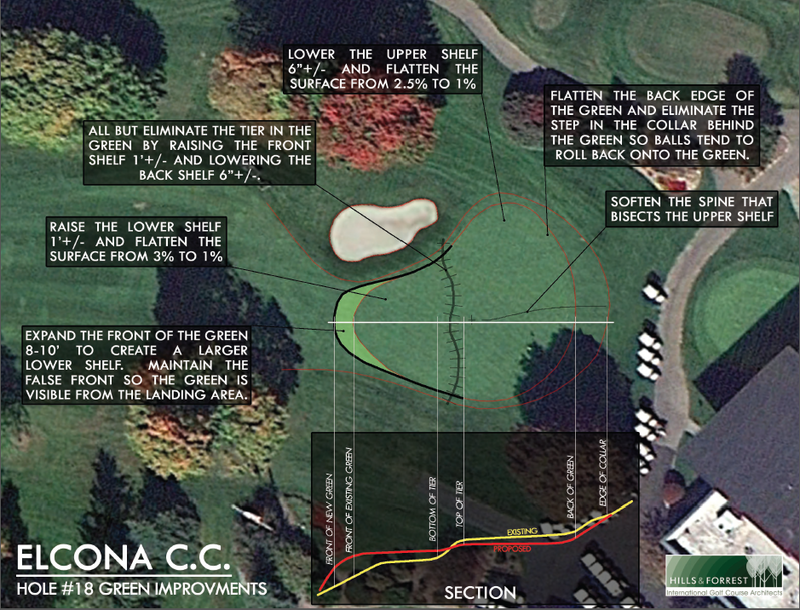 If you have any questions on 18 green or anything else, please contact me at ryan@elconacc.com, or at 574-295-6374. Thanks, and have a great week! Due to the weather forecast, we will be postponing tee aerification. We need a solid dry time window to properly clean up the plugs, and in my opinion we will not have that today. I will communicate a new date for tees when we can successfully perform this necessary practice.